Can you imagine what it would be like to not be able to sit because of pain? Sitting is something we all do a lot. We sit to eat, to socialize, on the way to work in the car or bus or on a bike, or at work many people sit most of the day at a computer or desk. So when someone is suffering from coccyx pain, it will affect many activities in their day, and yet pain in the coccyx region is poorly understood, and often not talked about because of embarrassment. The key to understanding coccyx pain is to understand the anatomy of the posterior pelvis and how this part of the body is involved in our movements, stability, and daily life. Firstly, the pelvis is made up of 3 bones: the 2 innominates and the sacrum, with the coccyx being attached to the inferior pole of the sacrum. 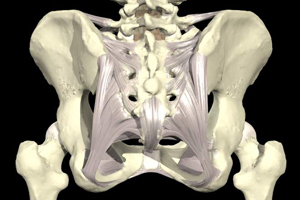 The pelvis is often considered to be the hub of the human skeleton because it connects between the spine and the legs, and has 35 muscles attaching onto it. The joints of the pelvis are also supported by some of the strongest ligaments in the body. Transversus abdominis: this muscle is the deepest muscle in the abdominal wall & it wraps around the lower abdomen from the belly button to the spine like a corset. Pubococcygeus: this is the front part of your pelvic floor, and it acts like the base of the canister, supporting under the organs and helping you to keep bladder and bowel control. The way these core muscles work (or not) is important in the story of how coccyx pain can develop. Research has shown that in a normal healthy body, the brain uses the core muscles to support your low back and pelvis when ever you shift your weight. That means, as you make the initial thought to move (for example from sitting to standing or standing to deciding to walk) the first reaction your brain will make is to turn on all these core muscles at about 5 to10% of their maximal force, without you thinking about it or being aware of it. The core muscle activity creates tension across joints of the low back, sacroiliac joints and pubic symphysis, and their continued activation maintains the support of these joints as your big muscles then turn on to create your movement. We rely on the feeling of stability we get from the core muscles working without us even thinking about it. Research has shown that pelvic trauma, child birth, posture and back pain can all inhibit the way our core muscles work. As our brain recognizes that the core muscles are not working, it starts looking for other options to try and hold us up. A common compensation strategy is for the brain to start gripping the deep buttock muscles, especially the coccygeus muscle. As this muscle starts over working constantly through out the day, the bones and ligaments it attaches to start to get sore and inflamed, and this starts the cycle of coccyx pain. The physiotherapists at Sydney Spine and Pelvis Centre are very aware of the different mechanisms that can lead to coccyx pain, and are actively involved in researching different ways to diagnose and treat this painful condition. Our treatment plan includes assessing the pelvis and lumbar spine for articular or muscle dysfunctions, specific releases of the overactive muscles and tight ligaments, and teaching you how to turn the over active muscles off so that the bone and ligaments can start to heal. Please contact us on 02-97199114 if you would like to make an appointment for one of our team to provide assessment and discuss treatment options. The first step is to relax your bottom. Imagine your bottom is a block of chocolate, and you are lying on the beach on a hot summers day. The sand is so hot it is making your chocolate melt. LET YOUR BOTTOM MELT OR RELAX. 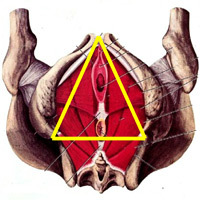 Now keep the back part of your triangle wide, and imagine gently lifting the tip of the triangle (your pubic bone) up towards your belly button. Imagine a string connecting your pubic bone to your belly button that is gently tightening upwards. See if you can hold this without your bottom tightening, and breath. Which of the “images” helped to get your bottom relax? Keep practicing this when ever you feel your bottom tighten up!